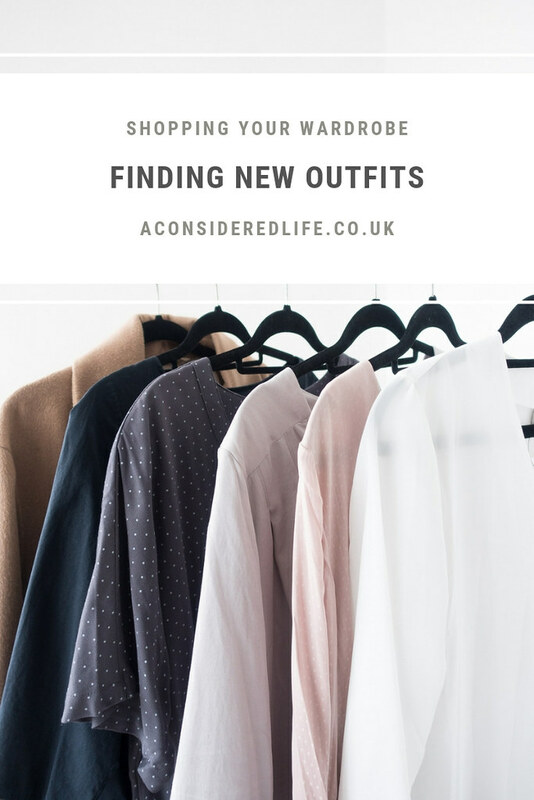 Maybe you’re trying to cut down on spending or want to invest in a more ethically conscious wardrobe - why buy more clothes when your wardrobe already has plenty? Before buying anything new, consider what you already own - it might surprise you. I try not to add too much to my wardrobe throughout the year. Whenever I'm considering something new I always "shop my own wardrobe" for outfit ideas before pulling the trigger on another purchase. It helps me avoid impulse buys that turn out to be terrible mistakes. Discovering different ways to style my existing wardrobe makes me fall back in love with the pieces I've grown tired of. The key to avoiding those feelings of not having anything to wear is making what you already own feel fresh and exciting again. You can avoid making hasty impulse purchases by falling back in love with the clothes you currently own. Remember that feeling you get when you purchasing something new and bring it home for the first time? You can get that feeling by shopping your existing wardrobe. Get started by clearing the decks and stripping back the excess. Give your wardrobe an audit to weed out anything you don’t wear, unwanted duplicates, worn out or faded clothing, and items that no longer fit or are uncomfortable to wear. Fix items that need repairing and recycle anything that’s beyond repair. Don’t keep anything that you don’t love or need. If you can’t see what’s in your wardrobe and you’re forever hanging onto items you don’t adore, you’ll never feel content with your style. Before putting everything back fix anything that’s damaged, dye discoloured clothes, keep items you need tailored to one side and donate or sell any unwanted items. When you’re done weeding out the excess, decide on how you’re going to organise your wardrobe. Create a system to make finding items easier. You can organise by type, occasion, colour, or season - figure out what will work best for you - and put everything back in order. Creating an organisational system for your wardrobe will help you see what you own at a glance, nothing will get lost in the daily shuffle, and you'll always know exactly what you own. After sorting through your wardrobe it’s likely you’ll find items you forgot you had or don't wear as often as you could. Take the clothes you already own and style them in new ways by layering, testing new colour combinations, and combining items you wouldn’t usually wear together. If you’re looking for inspiration, Pinterest and Polyvore are great for styling ideas; ask your friend’s for their opinions, try a capsule wardrobe challenge, or “window shop” online. Look for items that are similar to ones you already own and search for how others have styled them. Discovering new ways to wear the items already in your wardrobe can give you that thrilling rush of making a new purchase without having to spend a penny. With a minimal wardrobe it can be tricky to discover new outfits for such a small selection of items. If you’re struggling to mix-and-match in new ways, consider how else you could switch your style up. Jewellery and accessories can completely change an outfit and make all your clothes feel fresh again. They’re an effortless way to update your style without completing changing your look. Just like with your clothing, give your jewellery box and accessories a declutter to get rid of anything that has tarnished or become tangled. Create a capsule jewellery collection with jewellery staples that you can wear with everything you own. Work these accessories into your daily outfits to make your wardrobe feel exciting again.